The Miami Heat star is on his maiden visit to the country to promote the game. The 3-on-3 event will be held in Hyderabad, Bangalore and Delhi before culminating with the finals in Mumbai on September 29. Two-time National Basketball Association (NBA) champion Chris Bosh on Wednesday announced the launch of NBA Jam in September that combines 3-on-3 basketball and entertainment. "NBA Jam is a great event that brings excitement and energy of the NBA to the fans in India. It is exciting to see so much passion for basketball here and I look forward to working with the youth during my visit," he told reporters here. The Miami Heat star is on his maiden visit to the country to promote the game. The 3-on-3 event will be held in Hyderabad, Bangalore and Delhi before culminating with the finals in Mumbai on September 29. Almost 500 teams are expected to participate and it will also feature a women's division for the first time. The winning team will get the opportunity to compete against three NBA legends. 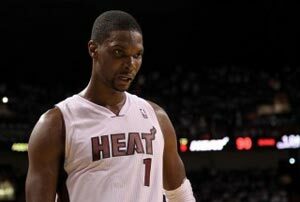 Bosh, who was also part of the Olympic gold medal-winning US team in 2008 in Beijing, said he never imagined that he would be part of an NBA champion side. "It was amazing. I never thought about the NBA championship, let alone winning back-to-back titles. I am so proud of my team mates and myself. It's a good feeling," he said.